For some of us, Wisconsin Dells means Noah's Ark, Tommy Bartlett's, or the Original Wisconsin Ducks. For others, it summons up images of camping and canoeing on the magnificent Wisconsin River. But for the lucky guests who've found Thunder Valley Inn it means a very special kind of Norwegian farm family hospitality! 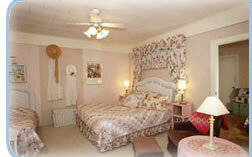 Thunder Valley Inn is a 130-year-old farmstead located just one mile from the historic Dells River District. 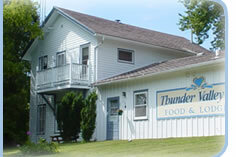 Though minutes from all Dells attractions, Thunder Valley Inn offers something unique to visitors-a slice of old-fashioned farm hospitality! Anita Christopherson Nelson and her daughters, Kari and Sigrid, share their sincere, warm welcome with every guest. Whether visiting the charming bed & breakfast inn or dropping by the farm restaurant for a homemade meal, the Nelsons will help you feel at home. You'll find sumptuous made-from-scratch food, servers in Scandinavian dress, and strains of fiddle music in the air. Also check out the farmers market we host on Sundays in the summer and fall for fresh, local produce and crafts. Children are welcome at Thunder Valley Inn and families will find it hard to pull their little ones away from our farm animal friends-kittens, goats, chickens, ducks, peacocks, and Benny the Bunny. Guests of the inn can also include a visit to the Nelson's working dairy farm where they can help feed the calves and milk the cows. In addition, Thunder Valley Inn offers their OLD-FASHIONED FARM THRESHING DINNER SHOWS. These family-friendly evenings are one of Wisconsin Dells' most unique attractions-from the locally-produced, slow-cooked beef pot roast to the strawberry shaumtorte for dessert, your entire family will never forget this 2 1/2 hours of toe-tappin' fun! As National Geographic Traveler Magazine said, "By the time you leave Thunder Valley, you'll have been so steeped in bygone times that theme parks will have no meaning; at this inn, they haven't even been invented yet." Velkommen from the Nelson Family! Follow us on Facebook! Keep up to date with all our activities!